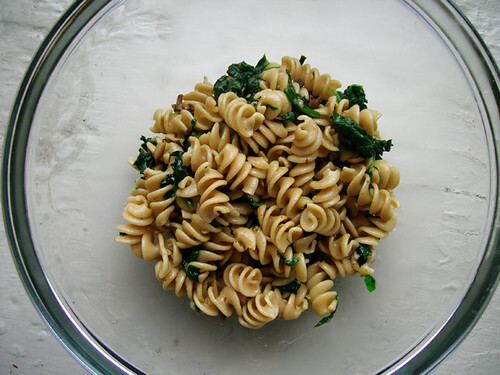 So this picture looks just like a drier version of last week's pasta with spinach recipe. But trust me, it is really different and really delicious. Heat olive oil in a saute pan over medium low heat. Wipe, trim, and finely chop the mushrooms, and add them to the pan. Peel and mince the garlic, and saute with the mushrooms over medium high heat until the mushrooms are softened and browned, about ten minutes. Meanwhile, wash and chop the spinach. You don't have to drain or dry the spinach before chopping, it will cook better wet. Add the spinach to the pan and saute until well wilted, about ten minutes. Season to taste with salt and pepper. Meanwhile cook the pasta until al dente, about ten minutes. Drain the pasta and when the vegetables are cooked, stir them together with about half the pasta and put away the rest of the pasta for later. If you have cooked pasta that you put away before, you can just add it right to the pan after the spinach is cooked and heat through.